Home »Natural Gas Issues»CBM: Coal-Bed Methane Gas? Lexam consulting geologist, Thomas A. Watkins, also identified Cretaceous-aged Mancos Shale and Jurassic Morrison Formation. Both Lexam’s recent press release and the earlier geological report suggest that Lexam’s target is “conventional natural gas”. However, the nearby Raton Basin (60 miles to the southeast), San Juan Basin (100 miles to the southwest), and Piceance Basin (about 100 miles to the northwest) are currently producing extensive amounts of coalbed methane (CBM) gas from Upper Cretaceous-aged coalbeds that overlie the Mancos Shale and Dakota Sandstone (Figure 3). Thus, we must ask the question: Is Lexam also hoping to find coalbed methane (CBM) gas in their drilling plan? Coal-bed methane (CBM) gas is gas that comes from coal deposits underground. Natural gas is stored along with water in cracks and micropores in the coal. To extract the gas, enormous quantities of water must first be pumped out (“produced”) from wells. In 1998 (the last year for which statistics are available), over 597 million gallons of water were “produced” from the Las Animas County methane wells in the Raton Basin in southern Colorado. A single well can require the “production” (removal) of as much as a million gallons of water. “Produced” water is typically highly saline and sodic and, if discharged at the surface, normally renders nearby agricultural lands infertile (Figure 4). 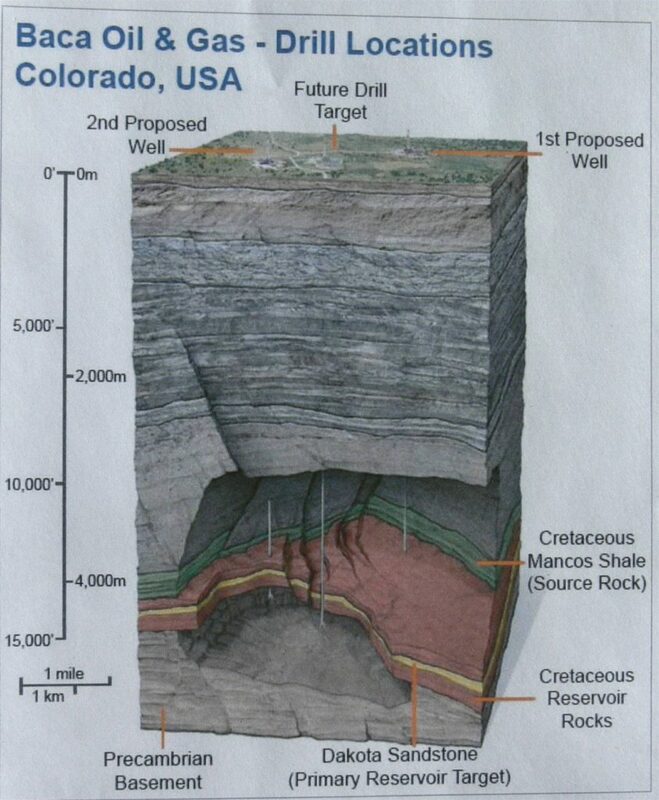 In Colorado, “conventional” oil and gas reservoir rocks include the Cretaceous-aged Dakota, Point Lookout, Cliff House, and Pictured Cliffs Sandstones. The “source rocks” are thought to be the Lewis and Mancos marine shales, each several thousand feet thick. Coalbeds, considered “unconventional” reservoirs, are found in the Fruitland and Menefee Formations in the San Juan Basin (Figure 3) and in the stratigraphically-equivalent Vermejo and Raton Formations in the Raton Basin. Coalbeds act as both source and reservoir rocks for methane gas. All of these formations are Upper Cretaceous in age and thus, overlie and are younger than the Mancos Shale and Dakota Group sandstone. Certainly, it is clear that very extensive CBM reserves are located in basins quite near to the San Luis Valley. Schwochow (1997) and Nelson (1999) make the following estimates of the largest coalbed methane reserves in the contiguous U.S. Thus, the San Luis Valley is surrounded by three of the largest CBM gas-producing basins in the United States (Piceance, San Juan, and Raton Basins). 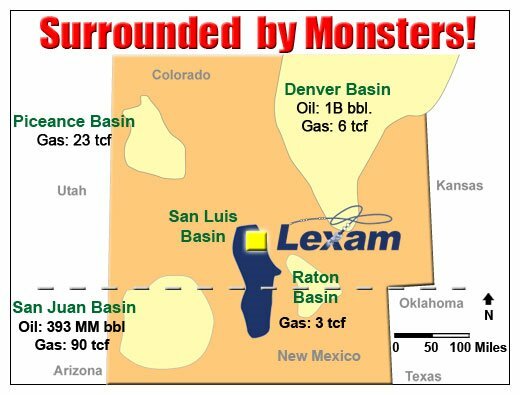 NO WONDER THAT LEXAM BOASTS TO ITS POTENTIAL INVESTORS THAT THE SAN LUIS VALLEY IS “SURROUNDED BY MONSTERS!” (Figure 1, below). However, there are very important geologic differences between the San Juan, Piceance, and Raton Basins, which are broad basins formed by folding and crustal compression during the Laramide Orogeny (about 80 to 50 Ma) and the San Luis Basin, which formed during much more recent crustal extension and rifting about 28 Ma (Geology of the San Luis Valley: What priceless treasures are buried here? Figure 1. San Luis Val). Indeed, the Laramide basins are much more likely to contain extensive expanses of source and host rocks for hydrocarbons. The San Juan Basin is a much larger feature that includes 4 million acres (about 6700 square miles) and is about 270 miles wide. Including production of both conventional natural gas and CBM, it is the second largest natural gas reservoir in the U.S. Estimates indicate the gas-in-place in the coalbeds exceeds the gas in conventional reservoirs. In the San Juan Basin, CBM is estimated to include 50 trillion standard cubic feet (Tscf) in the Fruitland Formation with another 34 Tscf in the Menefee Formation. There is an estimated 13 Tcf of CBM gas left in NW New Mexico alone. The main producing formations are the Dakota, Mesa Verde, Pictured Cliffs Formations and the Fruitland coal. Currently, about 65% of the total production of the San Juan Basin is CBM from the Fruitland coal. Although one can understand why Lexam would want to compare the San Luis Basin with adjacent basins in order to attract investors, this is not a fair comparison, geologically speaking. The San Juan, Raton, Piceance, and Denver Basins are all broad Laramidebasins that formed by major crustal shortening (compression) and folding during the Laramide Orogeny about 65 to 50 million years ago. In these basins, great thicknesses of Cretaceous sediments were buried more or less intact during downwarping of the earth’s crust. By contrast, the San Luis Basin is much narrower and was formed via crustal extension, block-faulting, and rifting about 28 million years ago. Geologists believe that during Laramide times, this part of Colorado was well above sea level. Hence, Cretaceous marine sediments were probably never deposited here in any significant thicknesses. This a very important distinction because it means that Mesozoic source rocks for hydrocarbons are probably not present in commercial quantities in the San Luis Basin. BUT…. if Mesozoic rocks are present here, why not Upper Cretaceous coalbeds and coal-bed methane gas too? Why Mining Coal-Bed Methane Gas Is So Polluting? The ability of coalbed reservoirs to store methane depends upon reservoir pressure, composition and rank of the coal, micropore structure, molecular properties of the adsorbed gas constituents, and reservoir temperature. CBM wells are drilled using techniques similar to those used for drilling conventional wells, but completion practices and the method of reservoir evaluation are different. 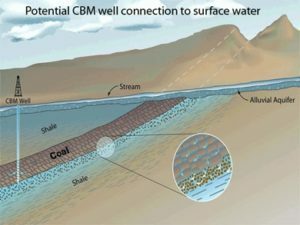 Because the methods used (“cavitation,” hydraulic fracturing, and removing “production water”) all can result in increased mixing of hydrocarbons with aquifer water, “the BLM has adopted COGCC order No. 112-61, which requires that the production casing of all coal-bed methane wells be cemented from producing horizon to surface by grout circulation methods.” This is done in order to attempt to minimize or preclude the inter-zonal flow of fluids between producing horizons and aquifers within the casing annulus. These mini-earthquakes could possibly trigger movement along the much larger Sangre de Cristo fault system located along the eastern margin of the San Luis Valley within about 10 miles of the proposed drilling sites. Past earthquakes in this area have been on the order of magnitude 7.0. Geological work here has established that the periodicity for approximately 7.0 earthquakes in this region is about 8,000 years. Unfortunately, the last such earthquake occurred 8,000 years ago (McCalprin, 1982). If a mini-earthquake were to trigger movement along the larger fault, there could be serious and devastating consequences. Since methane is stored (adsorbed) on micropores of the coal, and storage is a function of pressure (the higher the pressure the greater the storage potential), production of coalgas requires reduction of water pressure within the coalbeds. This pressure reduction frees methane molecules from the coal and allows upward gas migration. Thus, pore-pressure reduction is usually accomplished through removal of “formation” water by walking beam pumps, submersible pumps, piston lift or gas lift. Water/gas separators used for conventional gas production are modified to accommodate copious amounts of “produced” water and associated coal fines (small particles of coal that can pollute water). After hydrostatic pressure is reduced, methane gas is desorbed from the coal and is free to migrate through permeable strata and fractures to an area of lower pressure, ideally into well bores that created the pressure reduction. Since water must be withdrawn to reduce the pressure and allow gas migration, the volume of gas produced tends to build from a low initial rate to a maximum rate several years after the onset of production. (Conventional gas production rates are reversed, with the highest rates at the onset and a steady decline over the life of the well. When reservoir pressure drops below 150 psi, the well is no longer considered economic. It is estimated that less than 50% of the coalbed methane in place can be economically recovered by reservoir pressure depletion strategy. Thus, in areas like the San Juan Basin,enhanced production techniques have been used. Another one of the enhancement production techniques introduces nitrogen under high pressure through injector wells into individual coalbeds. Nitrogen sorbtion displaces the methane on the coal molecules and reduces the partial pressure of the methane. Beginning in the 1980’s, Amoco Production Company experimented with this technique and found that up to 80% of the methane could be recovered by introducing nitrogen gas into the coal. Next → Next post: Water and Gas Don’t Mix!